KINGSTON - The University of the West Indies (UWI) and IUCN (International Union of Conservation of Nature) Regional Office for Mexico, Central America and the Caribbean, have renewed a five-year collaboration supporting Caribbean countries to best manage and utilise important sea and land resources for the benefits of those who depend on them, ultimately contributing to the long term conservation and sustainable use of biodiversity. “We are pleased to be working closely with The University of West Indies (UWI) to improve the quality of data for protected areas in the Caribbean region not only for information purposes, but also to facilitate the decision-making process in different sectors. This is very important for the effective management and good governance of protected areas, as well as to ensure sustainability of biodiversity and natural resources,” said Viviana Sanchez, acting IUCN Regional Director for Mexico, Central America and the Caribbean. “I therefore look forward to lending my support and the resources of the UWI to BIOPAMA in this second implementing phase and expect increased access and agility with this multi-organization alignment,” he added. The BIOPAMA Programme in the Caribbean is coordinated by the IUCN Regional Office for Mexico, Central America and the Caribbean, in collaboration with the Joint Research Centre of the European Commission (JRC) and hosted by the UWI. 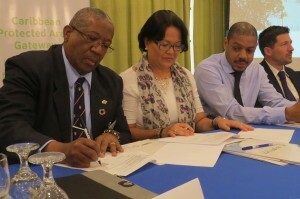 The signing of the IUCN – UWI agreement took place in the first day of the BIOPAMA regional relaunch. This meeting hosted approximately 60 participants from 21 countries in the Caribbean region and beyond who represented the stakeholders and potential beneficiaries of the BIOPAMA actions in this region.